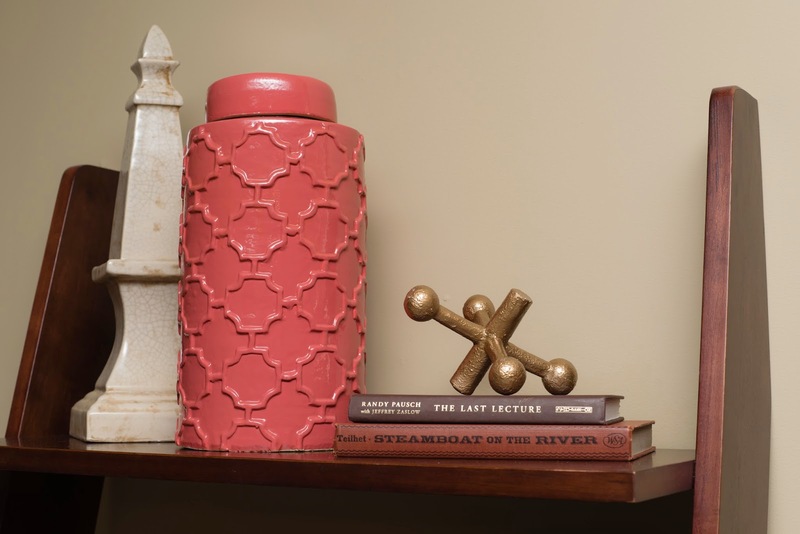 Stop by the ReStore blog where I'm sharing one of my secrets to accessorizing on a budget. Posted by Unknown at Tuesday, August 26, 2014 0 Comments - Click here to join the conversation! Happy Monday all! I'm back with the final blog post on my recent client project. 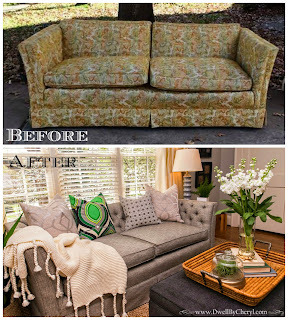 I couldn't move on without giving you the back story on the sofa transformation in this kid-friendly living room. When I meet with clients, I do my best to listen first. I mean REALLY listen. 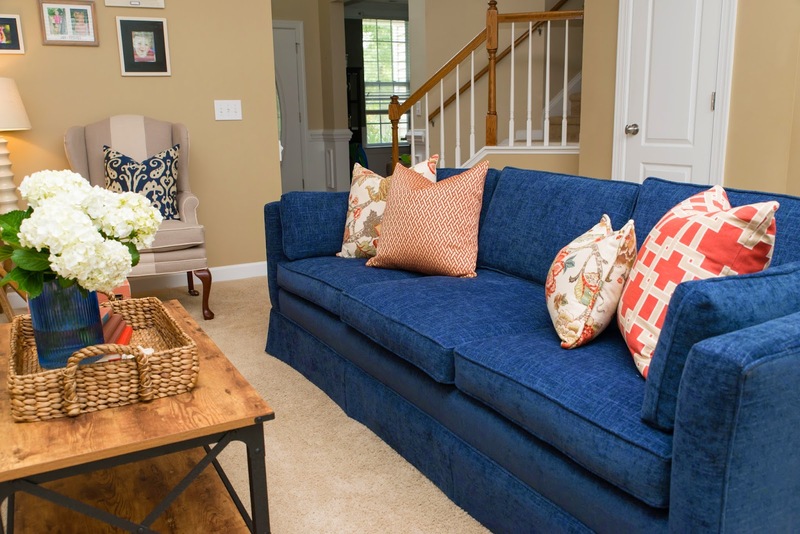 So when this young family said they wanted to replace their existing sofa with something darker and more modern, I immediately thought navy blue and vintage. Why vintage if they wanted something modern? So glad you asked. 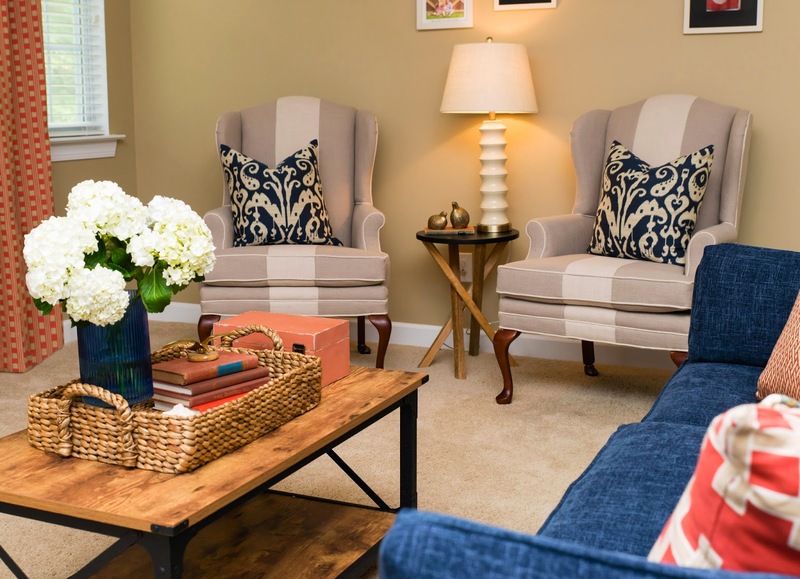 Everything old is new again and the fact is, those chic and often expensive furniture styles of today, likely mimic the styles of previous times. What you don't see it? Look again. The sleek square back and seat cushions, the side pillows, the length. 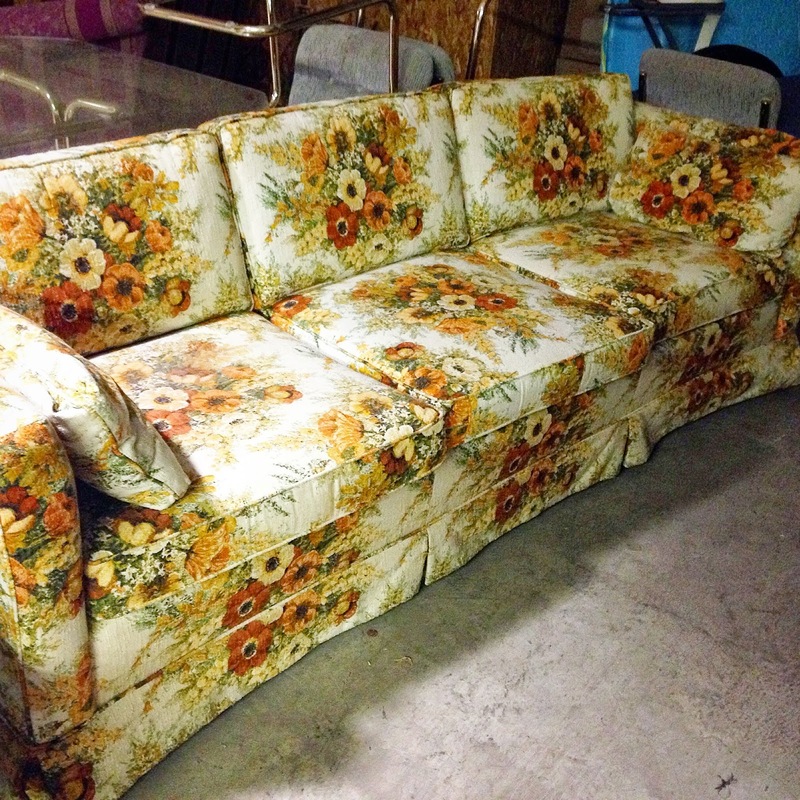 Well, I picked up this vintage Ethan Allen sofa for a song and knew it would be perfect. 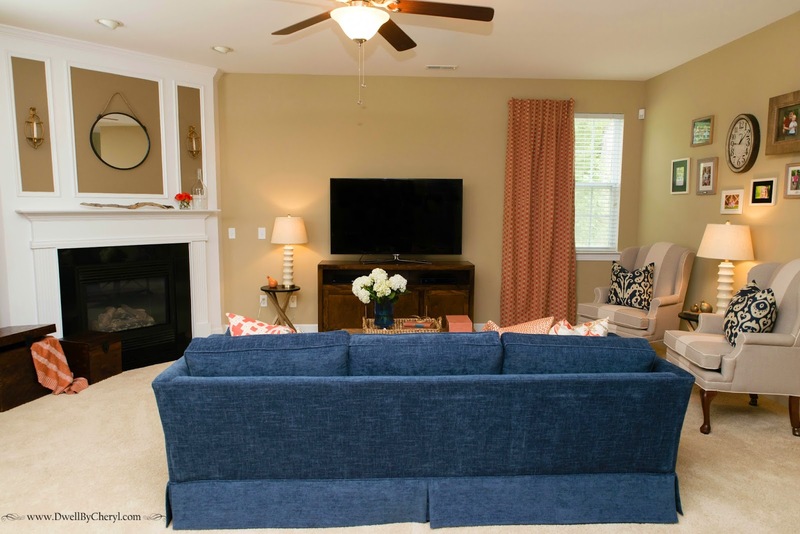 I chose a navy chenille blend for a soft touch and a color dark enough to mask stains. 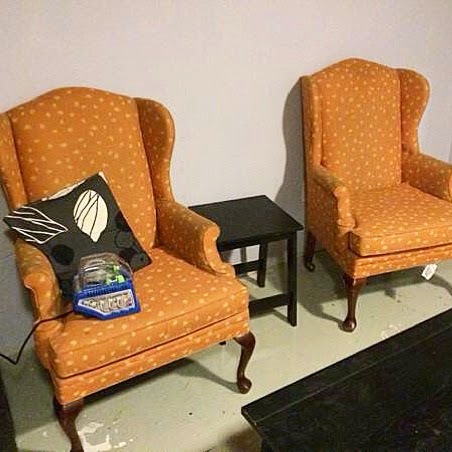 You just can't beat vintage furniture. You get so much more for your money. 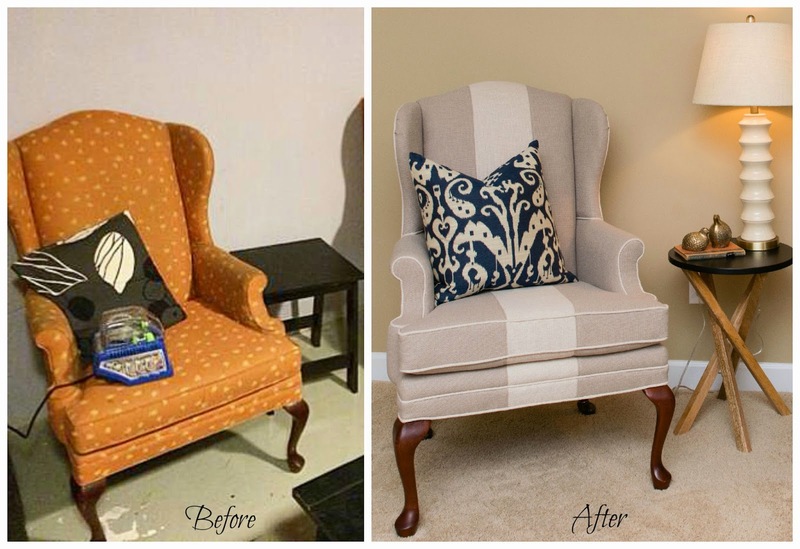 For a fraction of the cost of new, we were able to create a quality and comfortable piece of furniture that will stand the test of time. Posted by Unknown at Sunday, August 24, 2014 15 Comments - Click here to join the conversation! I love that with every project I learn a little bit more. Not very long ago I realized that I'd falling in love with furniture. 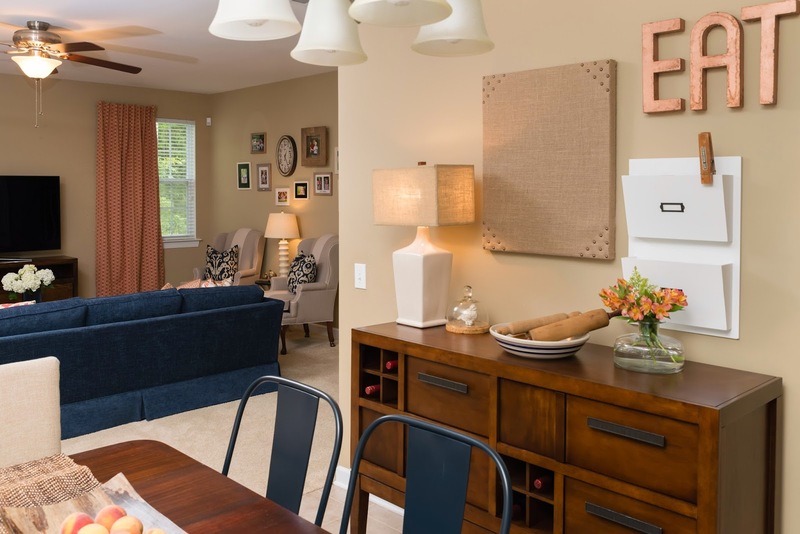 Ok, that may seem like an obvious obsession for an interior decorator, but it sort of caught me by surprise. I should probably clarify. I didn't just fall in love with furniture, I feel in love with vintage furniture. 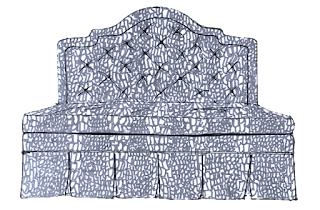 I love the craftsmanship that was so very prevalent in furnishings of yesteryear It's not that it's no longer available, but as a designer working with a budget-conscious clientele, real quality furniture is often out of reach. 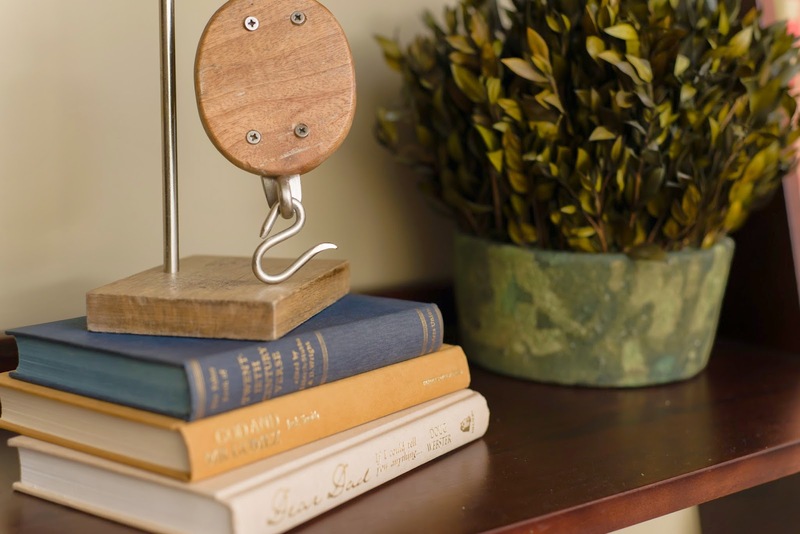 Thankfully, I've found that one way around this issue is reinventing vintage pieces. 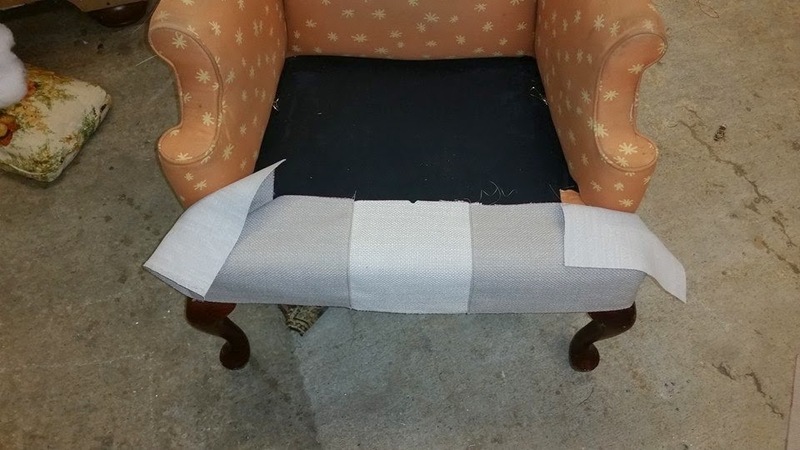 By now you probably know that my upholsterer and I have a "special" relationship. In my humble opinion, he's a genius. I love that he's a bit of a perfectionist and never backs away from a challenge. We often exchange late night text messages about ideas for future projects. I know, it's a little weird. I told you, we have a special relationship. 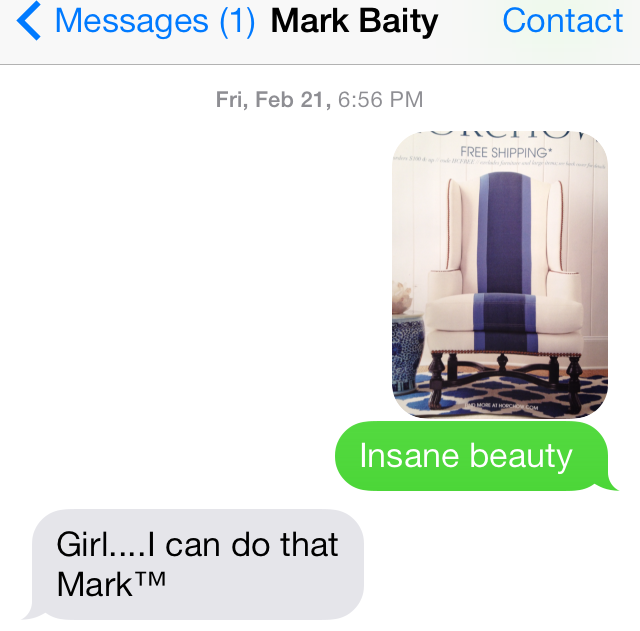 I recall sending him this text message after seeing this stunning chair in a Horchow catalog. Notice the lack of hesitation and confidence in his response. He truly has a passion for his craft and I can certainly appreciate and relate to that. 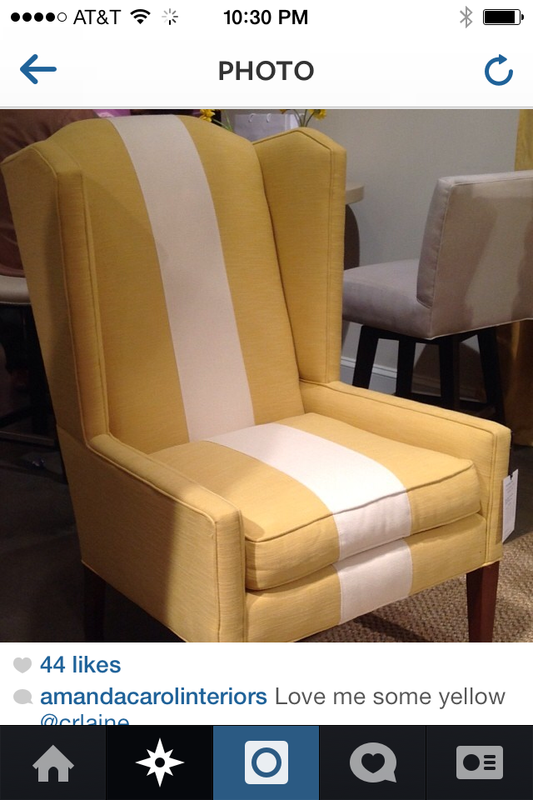 Fast forward a few weeks, during the Spring High Point Furniture Market and two of my favorite designers/bloggers both posted chairs from CR Laine with a very similar look. Needless to say, I was SOLD and bound and determined to bring the vision to life in an upcoming project. Thankfully my clients trusted me and were on board. The first step was finding the chairs. There is no doubt wingbacks are a dime a dozen on Craigslist. However, a set is a little more of a challenge to find. 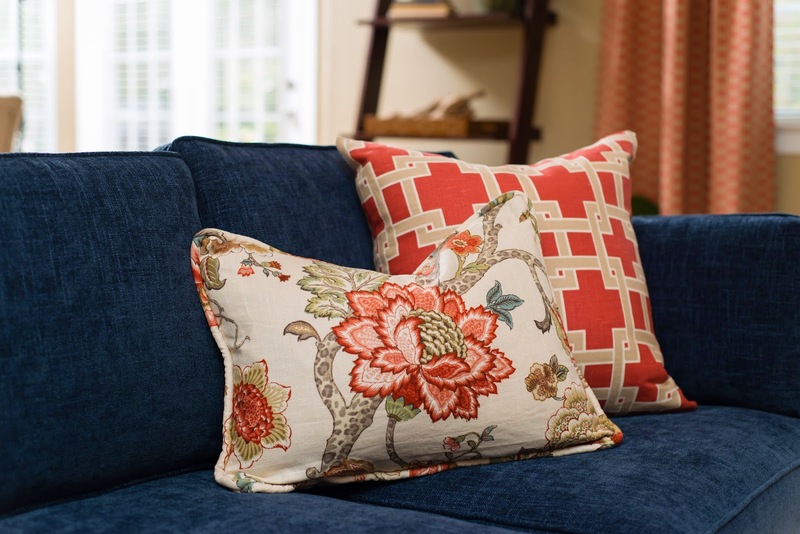 If you add to that the fact that you really need to get a great deal because upholstery isn't exactly cheap, then the hunt can take a little time. After about two weeks of searching I finally found this set at an amazing price. Yes, they were orange and quite dated, but I knew you can never go wrong with a classic. 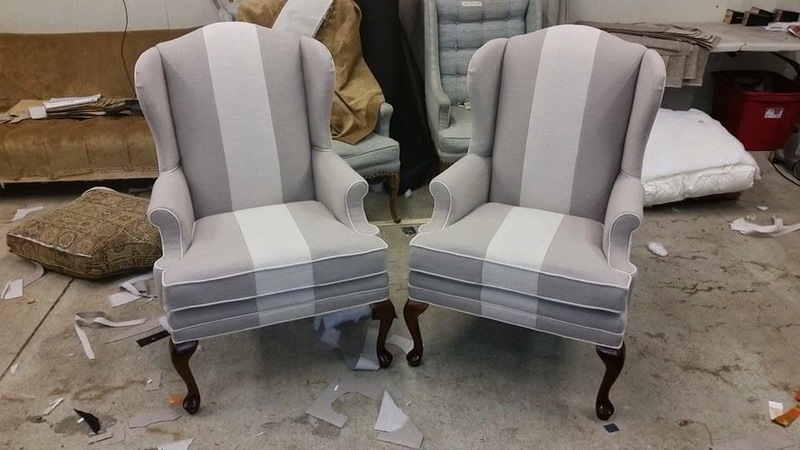 Honestly, I wanted one with Chippendale legs verses the Queen Anne style, but price was more of a priority than the style of the legs. 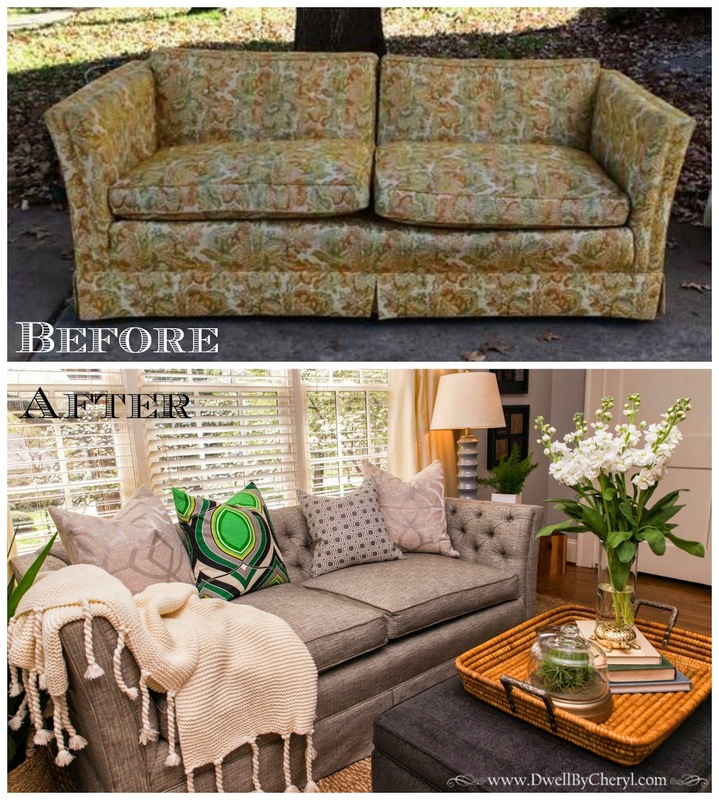 So with a plan in place and two hues of the same fabric selected, Baity's Custom Upholstery got to work helping me achieve the look for less. Mark is always good about posting the process on his Facebook page. I love that part. They turned out beautifully. I think they may have been my client's favorite part of the entire design. Can you blame them? 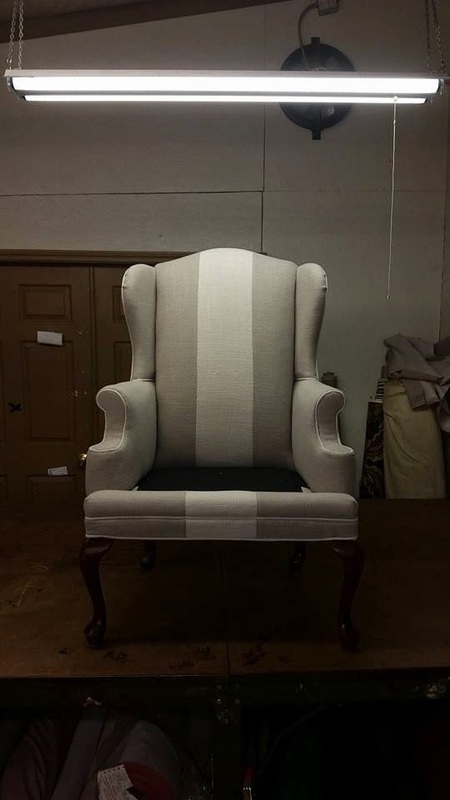 I LOVE a wingback. What can I say? I'm a traditional girl. They are so classic, comfortable and versatile. 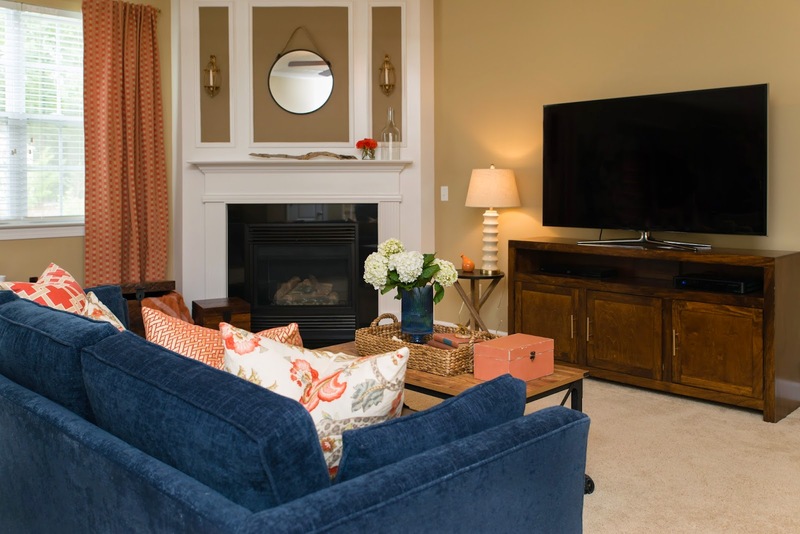 I get asked often about pricing, but out of courtesy to my clients, I don't share the pricing on items used in their projects. 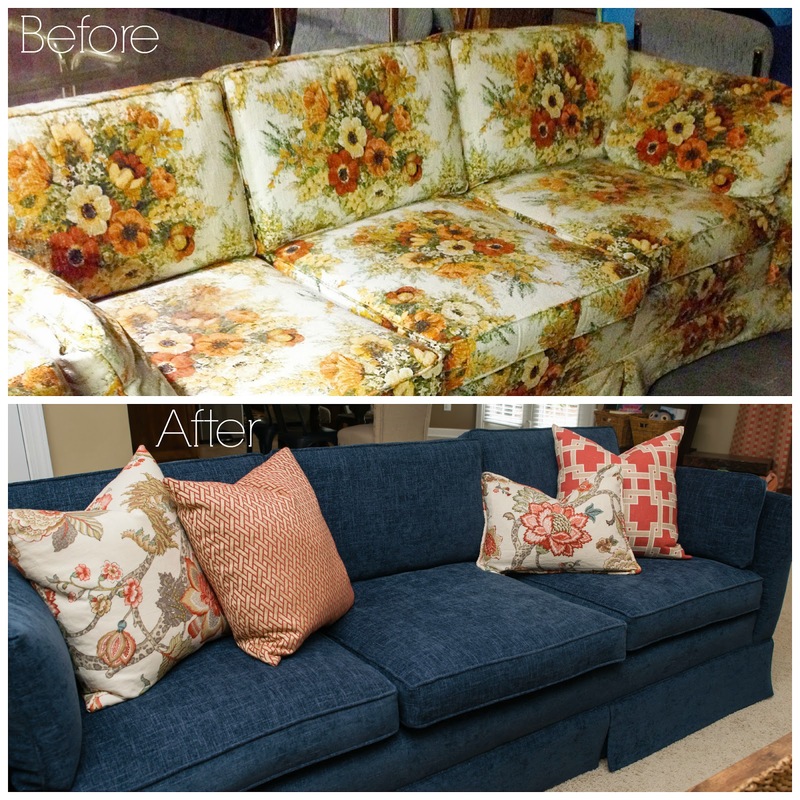 However, it truly depends on the going rate for upholstery in your area and the cost of the fabric. I'd love to hear from you. 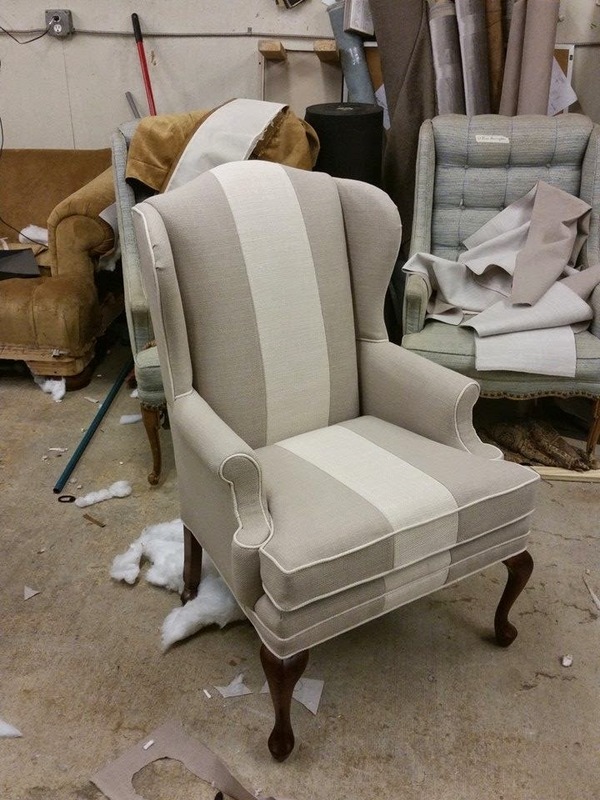 Until next time, Reduce, Reuse and REUPHOLSTER! Posted by Unknown at Tuesday, August 19, 2014 5 Comments - Click here to join the conversation! Well, it's my favorite day and you know what that means. It's REVEAL day!!! Weeks of hard work go into each and every project I complete, so it's especially sweet when I finally get to share the fruit of my labor. Last weekend, I installed a living/family room and eat-in kitchen space for the cutest young family. 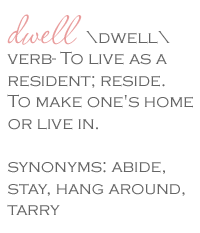 I'm so blessed to work with awesome clients who appreciate and trust me to help make their houses homes. 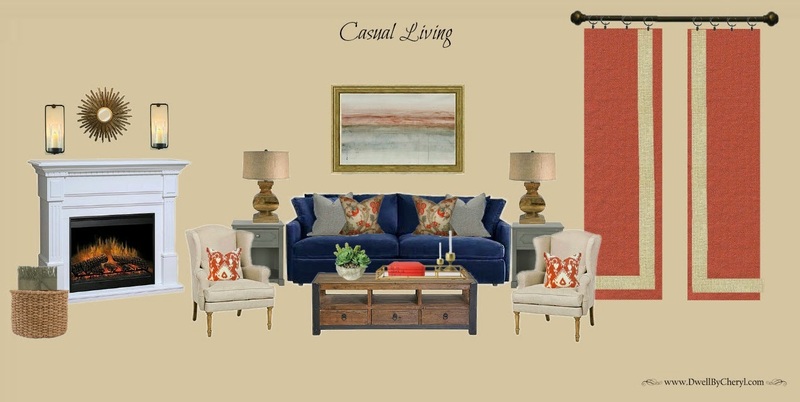 What I love most about this project was the navy and coral color scheme. 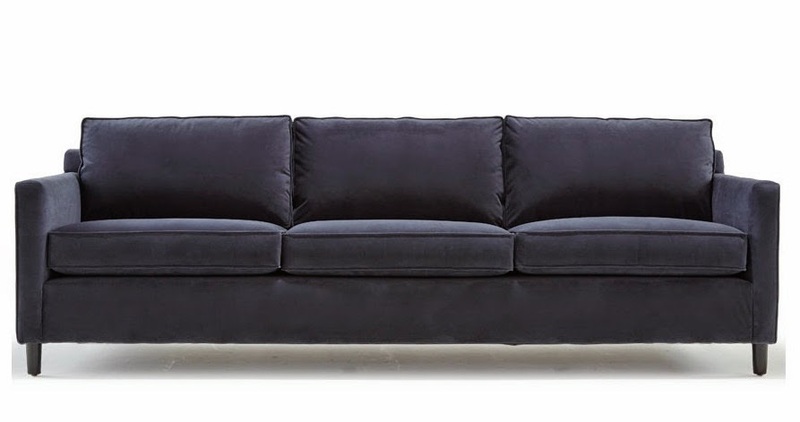 I think navy blue is an excellent choice for the sofa. I'll tell you more about the sofa (and those stunning wingbacks) later this week. 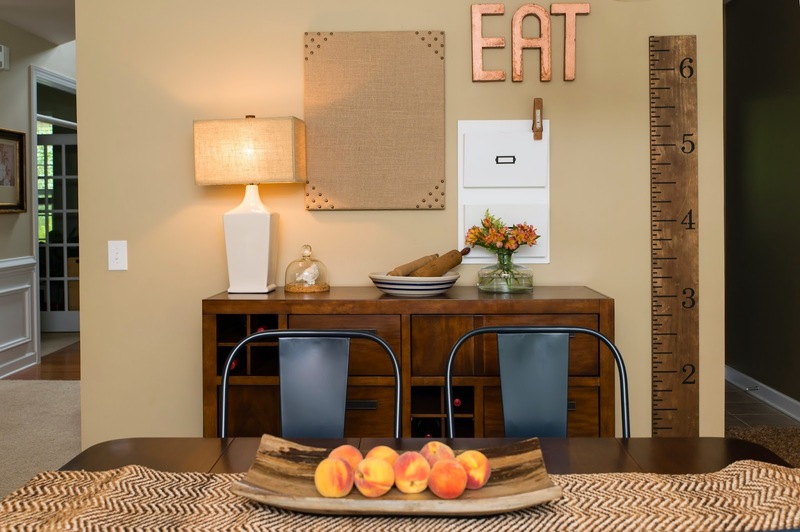 The attached casual dining space was working in terms of function, but just wasn't representative of the family's style. Thankfully, I think we solved that little problem. You know I'm a believer that design is in the details. It's the thing that I think most people neglect thereby causing their decorating efforts to fall flat. NEVER, I repeat NEVER neglect the details. I'll be honest, this project was a little more them than me and I'm totally fine with that. The more I do this, the more I learn that not every project will be completely my style. 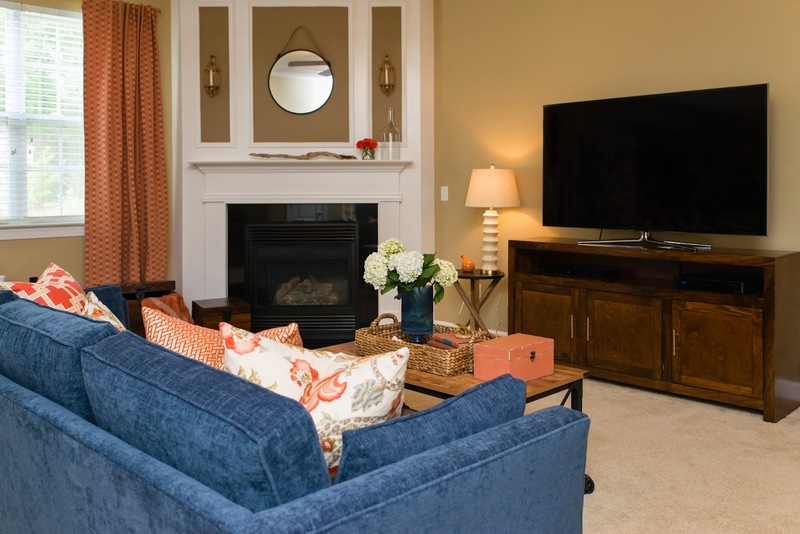 My mission is to create a beautiful and affordable space that allows my clients to dwell in a place they love. They loved it and I loved that they loved it. So.....What do you think? I'm dying to hear. Special thanks to Cam Richards Photography and Darcee Stiner. Note: As a courtesy to my clients I do not share sources for items used in their projects. Posted by Unknown at Sunday, August 17, 2014 8 Comments - Click here to join the conversation! Happy Friday y'all! Sorry I was MIA this week. I had a client install followed by a business trip that unfortunately left no time for blogging. If it's any consolation I'm back today to announce the winner of the Modern Masters giveaway. Great classic choice Denise and congratulations! In other news, here's a sneak peek of what's to come on Monday's client project reveal. Posted by Unknown at Thursday, August 14, 2014 0 Comments - Click here to join the conversation! Happy Friday! I recently explored a new Habitat Restore! 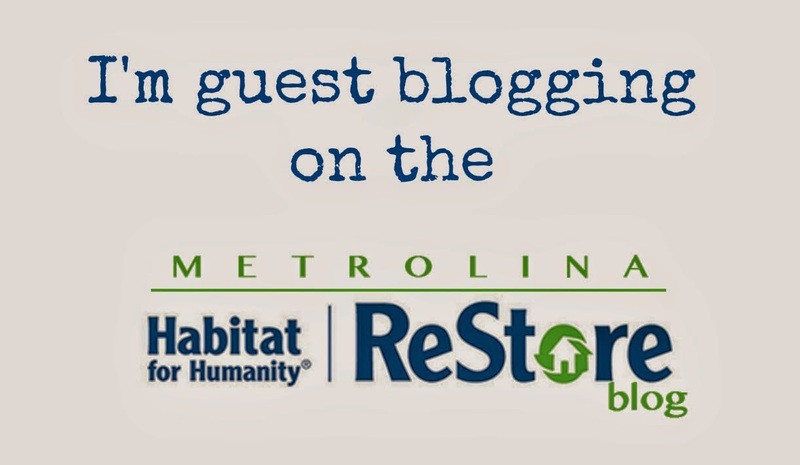 Stop by the ReStore blog to read all about my experience. Posted by Unknown at Thursday, August 07, 2014 0 Comments - Click here to join the conversation! Well today is the day. I'm back to share a little more about the fabulous Modern Master's Front Door Paint and to offer you guys a great opportunity to score a free quart of your own. 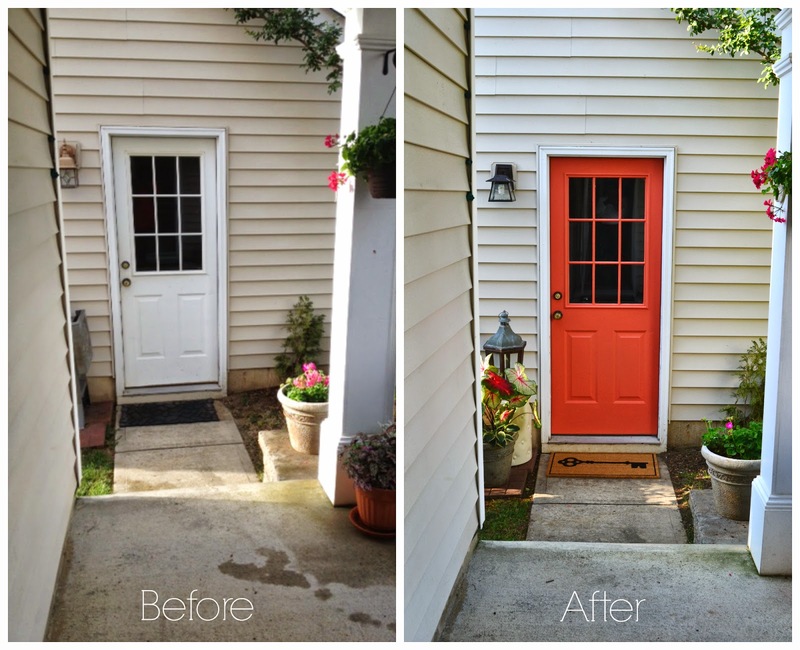 I'm sure you gathered from my last post that I couldn't be more pleased with the transformation of my back door. The paint was awesome! It dried quickly, went on smoothly and only required two coats. What else could you ask for? How about the fact that it NEVER fades? A point that was particularly important to me given the fact that my back door (garage entrance) is completely exposed to the sun and elements. I love that Front Door Paint comes in 24 colors glorious colors. I suppose that could be a little overwhelming for some. No worries, they have the coolest app EVER!! 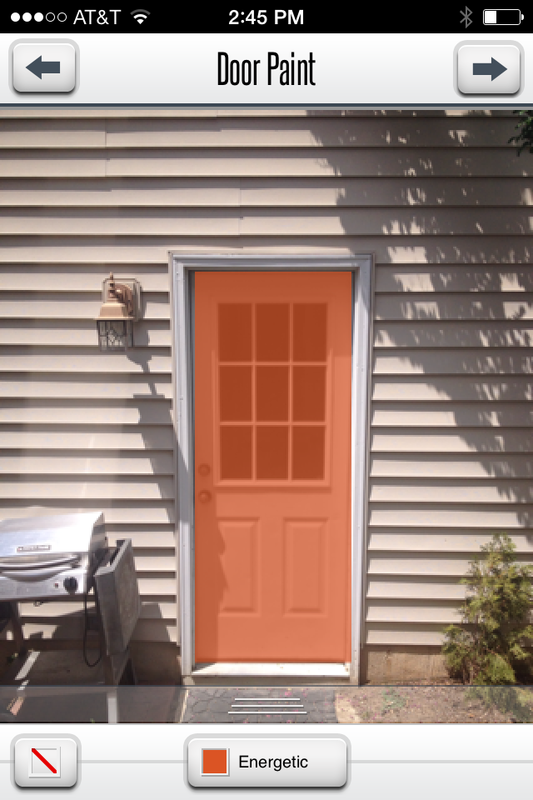 You literally just download the app, snap a picture of the door you wish to paint and try on a color. Here's an example of one of the colors I tried on in the app. Honestly, it was likely this helpful tool that revealed that I need to go with the darker "Cheerful" hue instead of the "Energetic" one. 1. 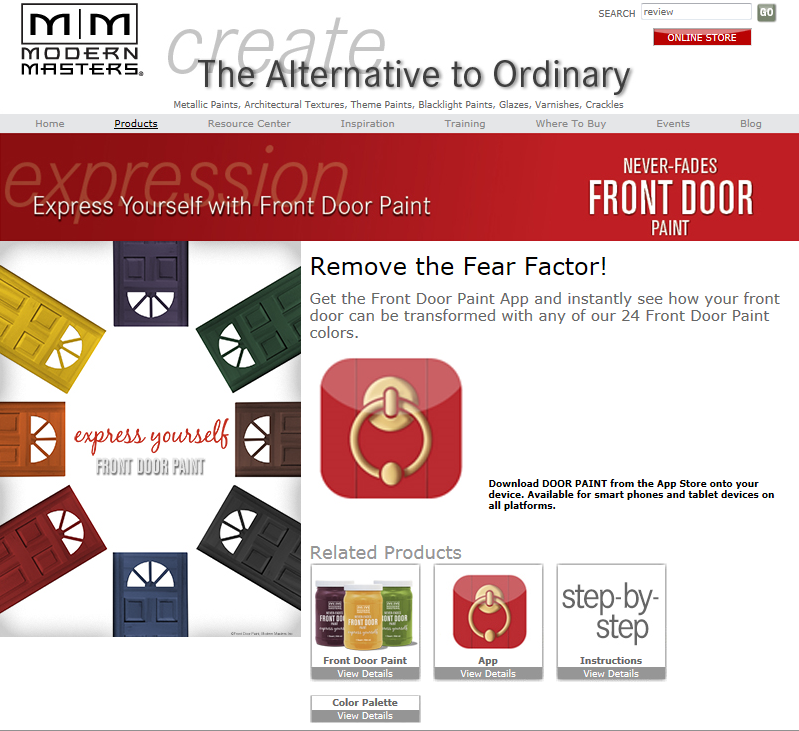 Browse the Modern Masters website and select one of the Front Door Paint colors you'd like to use for a project. 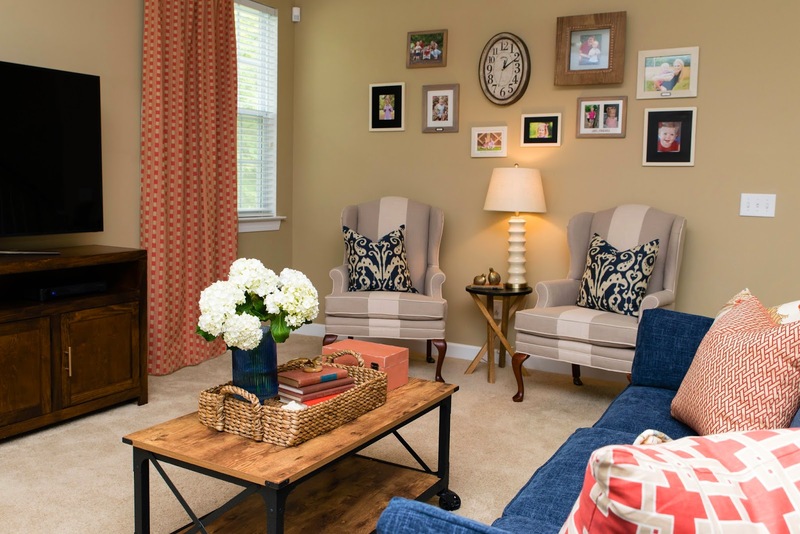 Keep in mind that Front Door Paint can be used for interior and exterior doors and trim. Plus, a quart of paint provides plenty to paint multiple doors. 2. 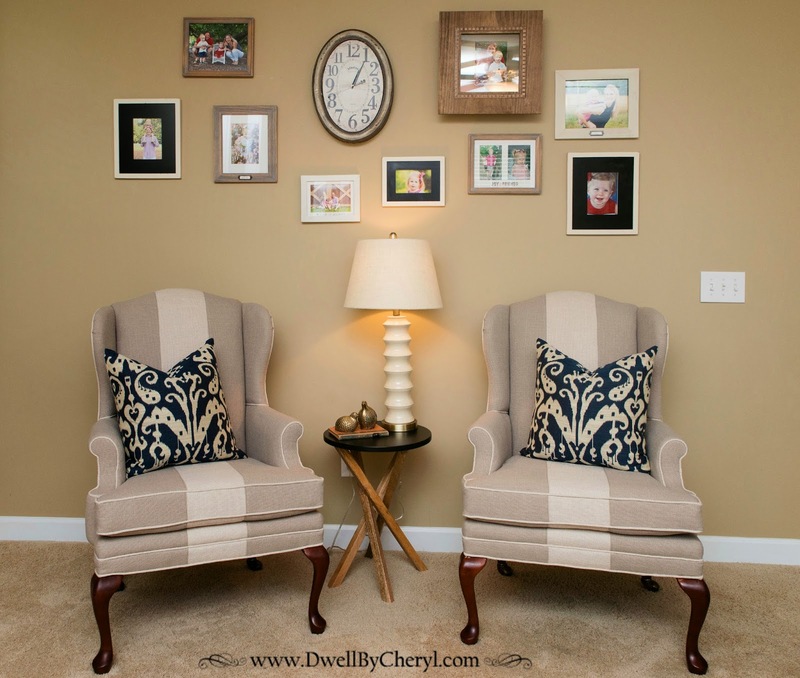 Return to the blog and leave me a comment telling me which paint color (emotion) is your favorite. Note: A maximum of five total entries. Only one comment is needed for all entries. The lucky winner will be able to select One Quart -any color of Front Door Paint with free shipping within the continental US. Yay! The giveaway will run through next Thursday. I'll announce the winner on next Friday. Good luck!! Posted by Unknown at Thursday, August 07, 2014 22 Comments - Click here to join the conversation! To say I’m excited about this blog post would be an understatement. I couldn’t wait to share my latest diy project with you guys. A few months ago I was contacted by Modern Masters, Inc. about doing a product review of one of their new products called, Front Door Paint. I immediately dismissed it knowing the major issues I had previously with my “Front Door Paint” and the Homeowner’s Association (read about that HERE). However, a few weeks later, it dawned on me that my back door might actually be a good candidate for their product. Go figure. 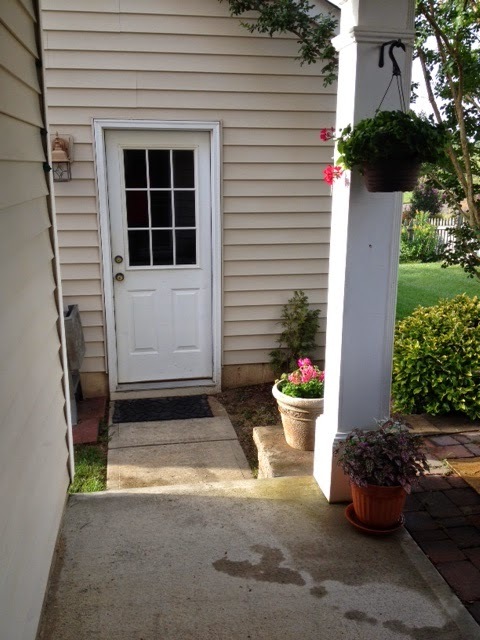 I have a detached garage that had a door that needed a little oomph, perhaps it was the perfect solution. 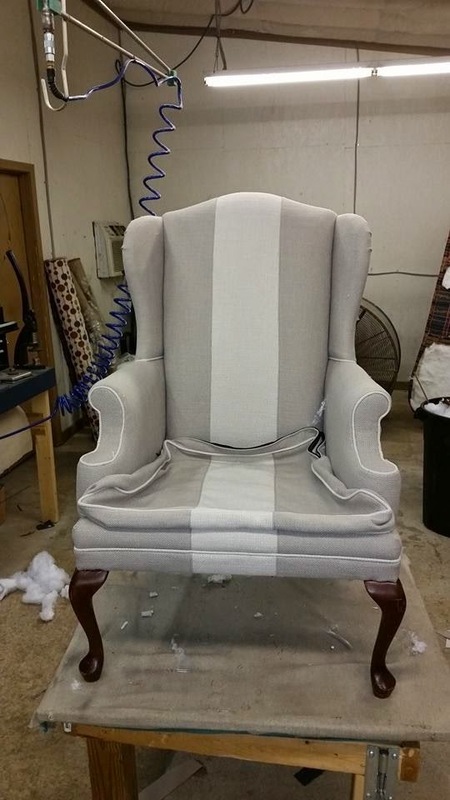 I reached out to them and they agreed and sent over a full size sample of their product in the color of my choice. The product actually comes in 24 glorious colors that correspond to various emotions. I love that part. I chose “Cheerful”. There's even a free app (for both iPhone and Android) to help you choose. I'll tell you a little more about that in my next post. Pretty fitting for me I suppose. It really is a cheerful color. 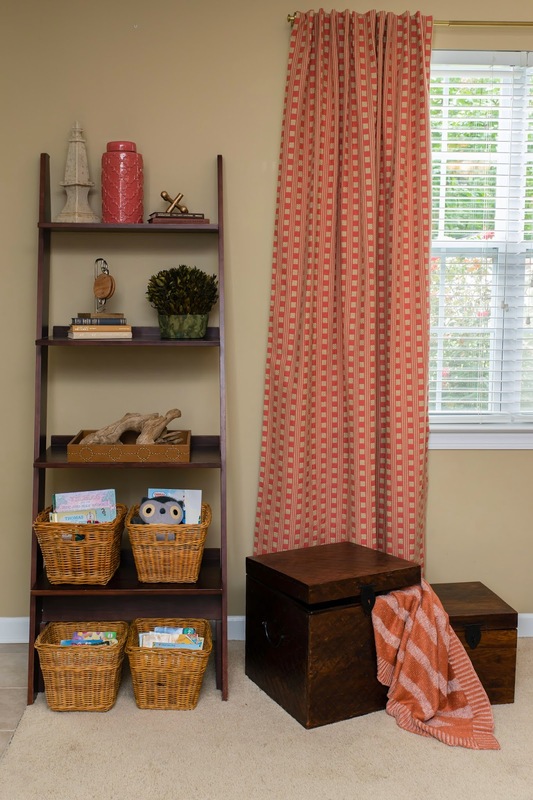 I chose it because this door is the door you see from my kitchen and my drapery is almost an identical match to “Cheerful”. What I loved about the paint is that I could immediately see the true color. Sometimes typical paint goes on in such a manner that it takes several coats to get to the color you’re looking to achieve. With Modern Master's paint, it seemed that with every single stroke of the brush, the intensity of the color was present. It motivated me to keep going. It also didn’t hurt that I only needed two coats for full coverage. This was the easiest paint project I’ve done in a long time. That’s saying quite a bit given the fact that this is the third door I’ve painted this year. The best part is the paint is water based so it dries quickly and NEVER fades. Yep, NEVER fades. I know! That's what I said! I cannot tell you how much I love this door. I can see it from my front door, when I'm in the living room, bedroom and when I'm in my kitchen and it makes me happy (I mean cheerful) every time I catch a glimpse of it. Thanks to a birthday party guest and a Target gift card, I decided to pick up this Threshold key mat. I mean, if you're going to paint a door it warrants a new mat. Right? Such a great color and a great finish. I put my handygirl skills to work and switched out the lighting too. Go me! Go me! BIG difference (let me know what you think)! For those of you in the Charlotte market, our Lowe's are now Front Door Paint retailers. If you're not in Charlotte, you can check for locations near you HERE. Thankfully it's available online too! 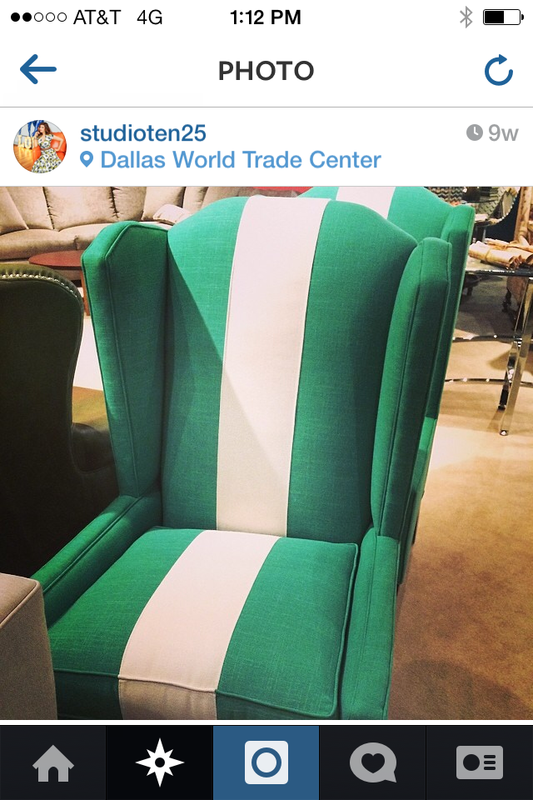 Posted by Unknown at Monday, August 04, 2014 7 Comments - Click here to join the conversation!